The adventure began with a bit of Indoor Skydiving, in the facilities of a prestigious company in Westchester, followed by another little Paramotor flight with his fellows, to clarify the thoughts and comment about the experience of the Indoor Skydiving , the weather was not favorable, the gray clouds announced rain, although they could not predict the real problem that was to come. Once Tucker takes off, he begins to relate his impression of Indoor Skydiving, describing it as an epic, sick and unnatural experience. In short, it was not very to his liking, since the free fall allows you to enjoy the immensity of the sky, while in Indoor, if you move your arm too much, you hit the tunnel glass, and that ruins the whole experience for him. After a few minutes of flying over beautiful landscapes, while eating some snack and talking about different things, and even answered his phone. Surprise! 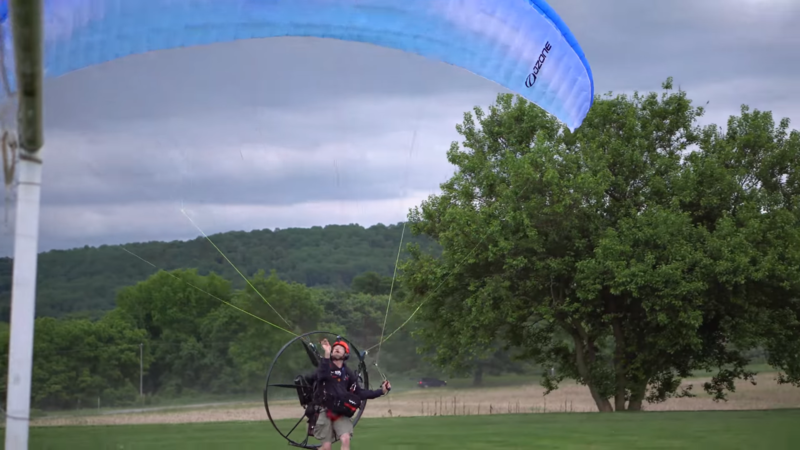 The rain did not ruin the trip, it was the engine of Jeff’s Paramotor that began to fail. The engine simply stopped. This evidently generated great tension, it is a very dangerous situation, but happily he handled to managed the flight and descend on a field of corn. This is a sample of what can happen if the relevant security measures are not taken. Every precaution is small and learning from the mistakes of others is a luxury that we can not let go. 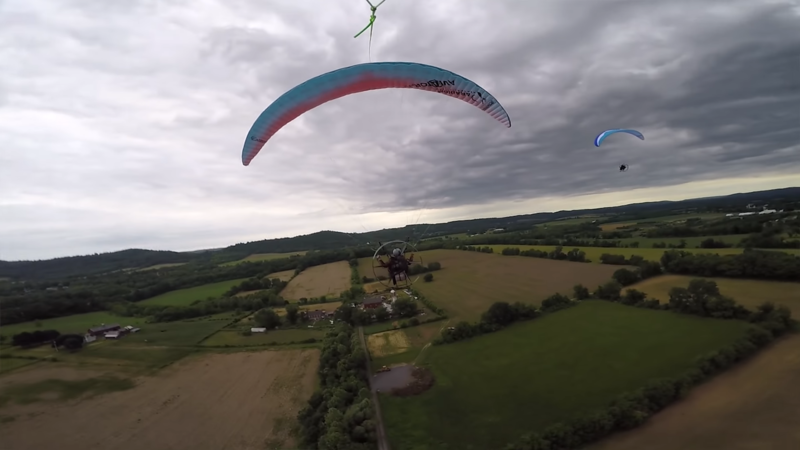 Fortunately, even if the engine stops, the paraglider allows the descent to be quiet, however, it will be a bit faster than a parachute descent due to the additional weight. The safety in paragliding depends on the good training of the pilot and the adequacy of the wing and the meteorological conditions at their level. Flying with insufficient training, with a sail too difficult, or in conditions that exceed you can be very dangerous. 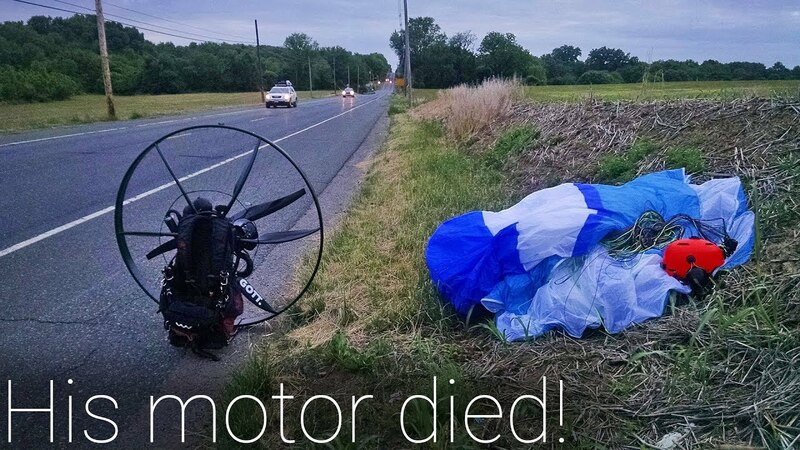 95% of the accidents that occur in the paramotor are due to pilot errors and therefore we can not and should not let the novices or people outside our sport think it is a matter of chance or bad luck. School flights, carried out with wings that are easy to fly and always in calm air conditions, involve minimal risk. The quality of the training, and a certain control of the pilots fresh out of school thanks to a system of qualifications, make accidents among beginners have decreased in recent years to really low levels, despite the possibility of an accident obviously continues to exist. Paragliding does not behave especially well in thermal and turbulent conditions and it takes a lot of experience and expertise to control certain situations. Flying under these conditions can be really dangerous. That is why the purpose of this data entry is to give the opportunity to share our experiences so that other colleagues learn from our mistakes and we can avoid accidents clearly “avoidable”. After a few minutes of flying over beautiful landscapes, while eating some snack and talking about different things, and even answered his phone. Surprise! 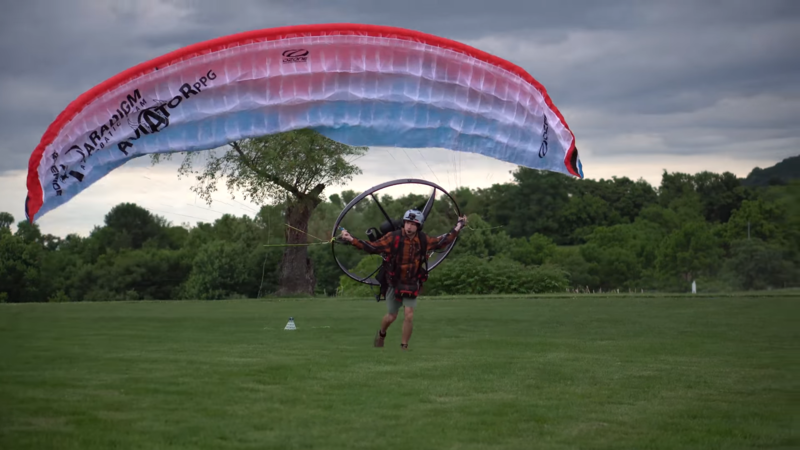 The rain did not ruin the trip, it was the engine of Jeff's Paramotor that began to fail. The engine simply stopped. This evidently generated great tension, it is a very dangerous situation, but happily he handled to managed the flight and descend on a field of corn. i started to scroll down to see who posted the time of the motor out, then i seen tucker posted it and that is what made my decision to watch the whole video. also, thanks for caring about the farmers corn. great respect. Tucker Gott Hey, can you either PM me here or respond to my Facebook message? I live in Hopatcong and I know you live remotely close to me in North Jersey near Wantage or Milford. 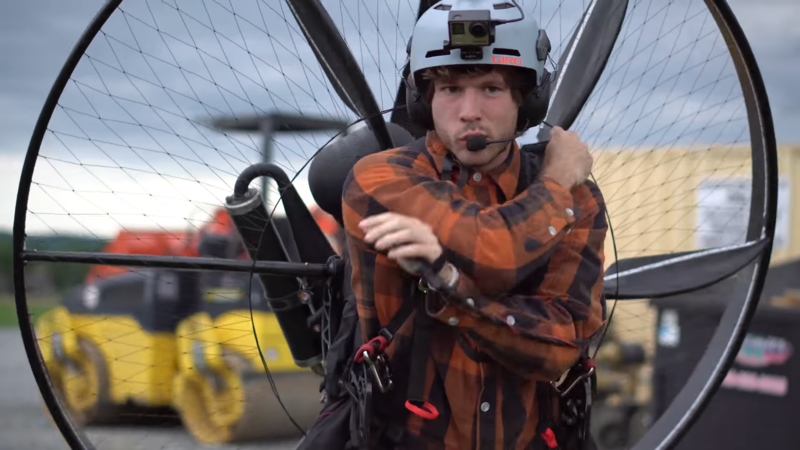 I really want to come out to meet you and learn more about the paramotors as I’m thinking of buying one. Thanks! Could have just been a random piece of whatever in the fuel system that plugged the low speed (pilot jet, ironically) jet momentarily, then broke up and passed through the engine, or a small amount of water sloshing around in the bottom of the tank (right where the carb picks up fuel – very common with 10% ethanol pump gasoline) that made it’s way through the filter and into the carb, or, there could have been a venting problem where air wasn’t allowed into the tank, creating a vacuum (not likely, since this would have kept happening over and over – run for 5 minutes, die, wait 5 minutes, it starts). If an ignition coil, or ignitor unit were failing, this can happen randomly only when hot, and will eventually become a no-start/no-spark situation. Sounds to me like there was just a random piece of debris that momentarily blocked the pilot jet, or a few drops of water passed through the carb. Got to keep fuel cans clean, and above all, SEALED tight. yo, whats under the tarp? An overheated ignition coil will do just that. Stop till cool off then start. Not that’s something I have always wanted to do ever since I learned about indoor skydiving! Great job!! Very thoughtful of you to be thinking of the guys new corn plants! I’m impressed dudes!! I don’t know what kind of fuel tank vent that thing has but if there was a vacuum created in the fuel tank for some reason, it could eventually shut down. If there’s nothing mechanically wrong with the engine, maybe check the kill switch wiring? It might have grounded out on something. I love the music you choose for your viddies 🙂 Its all really unique and catchy! It would be neat to get a playlist of it. does the sun set at 8:30 PM in this place? In the summer time, yes. Thanks for being good stewards and respecting the farm field – not that you wouldn’t, BUT sets a good example for the aviation community in general. Nice Vid! Ok, the car stopping just to take pictures cracked me up. Hey Ma, get off the dang roof! There’s a lot of nice people over there stopping to help out… really nice to see… also could you talk about the thought process behind choosing an emergency landing spot from high up to refining that first decision as you get lower .. thanks Tucker! !